As a business owner, image is everything. Creating a warm, inviting atmosphere is not only crucial to attracting new customers, but maintaining your profitability. Stained awnings and dirty sidewalks can project an unappealing image for a passerby. You want your building’s exterior to help maximize your full commercial potential through exceptional cleanliness. Your company is your livelihood and you can’t afford to hire an unprofessional and untrained commercial power washing business. From strip malls and homeowner’s associations, to storefronts and apartment complexes, you need a trusted name to not only extend the longevity of your building, but also bring all the knowledge needed to complete the job correctly, the first time. The experienced power washing team at Northern Power Washing has been helping the business owners with all their roof and wall washing needs since 2010. Northern Power Washing is proud to offer a wide range of annual services to our customers, but also to be the ONLY company practicing the safe and effective soft washing power washing. Minimally-intrusive and safer on exteriors, soft washing has left numerous stores and commercial spaces looking brand-new. Utilizing green and eco-friendly cleaning solutions, we ensure that bacteria and mold growth is killed, on the spot. Starting off with a combination of cleaning agents designed to remove any contaminant build-up, our team will apply an initial coat to break up any debris accumulation. 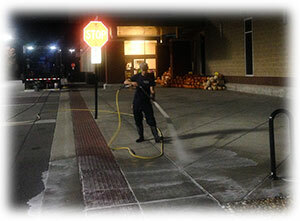 After allowing the solution to seep into the surface, we simply wash it away with low-pressure water, which avoids any unnecessary damage to your sidewalks, storefront, or signage. The end result is a crisp, clean exterior that will keep you customers coming back time and time again! Your company’s outside appearance is extremely important to you and your customers. It deserves to be protected with regular power washing treatments to remove any unsightly stains and damage that may build up over time. For a free estimate and consultation at your place of business, contact our commercial power washing experts at (847)-321-8261.